With the completion of the NBA Draft and the annual coaching and transfer carousels nearing their ends, RTC is rolling out a new series, RTC Summer Updates, to give you a crash course on each Division I conference during the summer months. Our Big East update comes from frequent RTC contributor Brian Otskey, co-author of Get to the Point. Connecticut Revels In National Championship Glory: Connecticut’s storybook year continued on into the offseason as the Huskies were invited to the White House for an event with President Obama on May 16. The team presented the president with a #1 UConn jersey and posed for photographs after being lauded for their remarkable accomplishment. Connecticut made one of the most improbable runs ever en route to the third national championship in school history, all coming since 1999, going 23-0 outside of Big East regular season play. Nobody could have predicted the way last season unfolded and the NCAA Tournament as a whole was a microcosm of that. 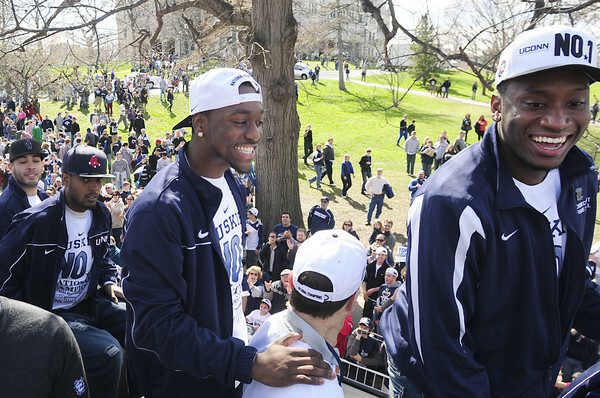 Connecticut’s national title made up for a lackluster performance by many of the record 11 Big East teams participating in the tournament. 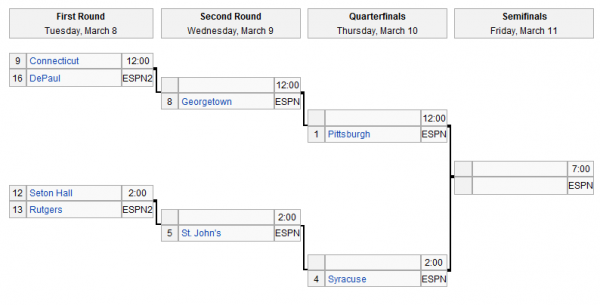 Only one other Big East team (Marquette) managed to make it to the second weekend’s Sweet 16. 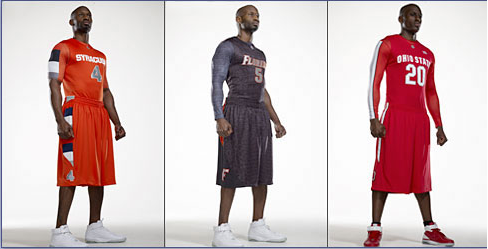 Life without Kemba Walker has begun in Storrs and while the Huskies will be among the 2011-12 Big East favorites, it’ll be very interesting to see who steps up and how the team performs without its warrior. Jeremy Lamb appears to be ready to take over but the way Shabazz Napier and Alex Oriakhi handle their larger roles will be the difference between a team contending for a Big East title and one that finishes fourth or fifth. The Ed Cooley Era Begins In Friartown: After Keno Davis stumbled to an 18-36 Big East record over three seasons in Providence, the Friars desperately needed someone to revive their moribund program. Providence has made only two NCAA Tournaments since its 1997 appearance and the last one was eight seasons ago in 2003-04. Enter Ed Cooley, a Providence-born 41-year-old with the fire in his belly needed to succeed in arguably the toughest job in the Big East Conference. Cooley will instill a system of discipline and fundamentals with a special attention to defense, three attributes of successful programs that were sorely lacking under Davis. Cooley’s Fairfield team ranked #22 in the nation in defensive efficiency last season and he improved the Stags’ record each and every year he was there. Providence, a small Catholic school with hardly any recruiting base along with limited facilities and resources, is an incredibly difficult job even before you have to go up against bigger schools like Syracuse, Louisville and Pittsburgh along with tradition-rich programs such as Georgetown, Villanova and Marquette. Cooley must spend his first season laying the foundation for longer term success. He won’t turn this program around overnight but more discipline on and off the court and hard work on the recruiting trail can turn Providence into a solid Big East competitor. 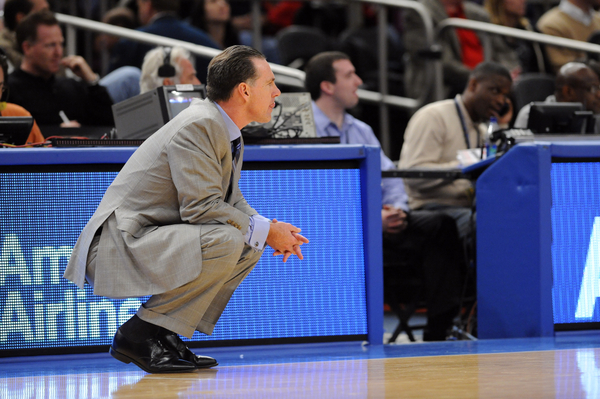 We can’t think of many people better suited than Cooley to get the job done at Providence. While it will be a long and difficult process, brighter days are ahead for the Providence program with Ed Cooley at the helm. Signs Of Life In The New York Area: New coach Steve Lavin and St. John’s brought the buzz back to the Big Apple last winter as the Red Storm earned its first NCAA bid in nine seasons. “Lavinwood” has moved east, but St. John’s now enters a year full of mixed feelings. Cautious optimism as well as uncertainty rules the day with nine new faces, part of the nation’s second-ranked recruiting class, making their way to Queens in 2011-12. Malik Stith is the only returnee of note after Dwayne Polee, II, decided to transfer closer to home at San Diego State. St. John’s may be the most unpredictable team in the Big East entering this season. The potential exists for a terrific year if Lavin can mold all this raw talent into a cohesive unit capable of playing with any team in the conference. However, issues with young players, commonly involving playing time and egos, are also very possible and it takes only one incident to destroy the locker room and wreck the season. The Johnnies have enough talent to make the NCAA Tournament again, but Lavin will have to totally adjust his approach to make that happen. With hardly any experience on the roster, he can’t simply roll the ball out and hope for the best. This season will be the biggest test of Lavin’s coaching career on the court, but he faced an even more difficult challenge last year, coaching the entire season with prostate cancer while keeping it a secret until this spring. Turning St. John’s around with that constantly in the back of his mind is an a commendable achievement and we obviously wish Coach Lavin the best of luck fighting this awful disease. Across the Hudson River in New Jersey, Mike Rice and Rutgers appear to be building a program to be reckoned with down the road. The Scarlet Knights have been a dormant program for 20 years, never once enjoying a winning season in any of its 16 years as a Big East member. That may be about to change, although it appears unlikely that Rutgers will crack the .500 mark in league play this season. The fiery Rice reeled in a top 25 recruiting class and now must build on a season of close calls and what-ifs. Rutgers was competitive last year, but could only manage five Big East victories. It’ll take time for the new players to adjust to the collegiate level but bigger and better things should be expected from Rutgers in the years to come. Rutgers, a large state school, has the capability of becoming a pretty good program. All it needs is a commitment from the administration, facility upgrades and great recruiting. Rice is taking care of the latter, now it’s time for the Rutgers brass to provide him with the resources needed to build a top flight program. Rutgers needs major facility upgrades (a RAC renovation has been talked about for over a year), but fundraising has been a major problem. With New Jersey Governor Chris Christie trying to get the state’s financial house in order, there is going to be a lot of resistance to an ambitious project such as this one at the state’s flagship university. George Mason took out a fizzling Villanova in the first round, and continues to carve its own identity separate from the 2006 Final Four squad. The Wildcats’ season is over, and considering it lost 11 of its last 16 games, including its final six, perhaps it’s for the best. The blistering performance Marquette put on Xavier Friday night sent a big message to its doubters. The Golden Eagles shot 57% on their end, and put the clamps on star Musketeer Tu Holloway. Next for Buzz Williams‘ team is Syracuse, a team Marquette beat earlier this season. Syracuse stuck to its game plan of feeding Rick Jackson and polished off Indiana State. The game ended at 12:41 AM local time in Cleveland (more on this later), and set up an intra-conference battle with Marquette on Sunday (this too). For Lorenzo Romar and company, winning away from home has been a large concern, but it shook off the stigma, if only for one night, in their win against Georgia. Is it open season on Bulldogs head coach Mark Fox? West Virginia may mix in a 1-3-1 look on defense today when the Mountaineers clash against Kentucky. The game is a rematch of last season’s regional final in Syracuse, when WVU bested John Calipari‘s team in the Carrier Dome. The Southeast region has a full slate on Saturday, including a battle between Florida and UCLA. Though the rosters have turned over, UCLA can exact revenge from elimination at the hands of the Gators in the 2006 and 2007 Final Fours. Gonzaga faces the same question posed to the 35 teams on BYU‘s schedule to this point – how do you stop Jimmer Fredette? It seems like there’s nothing out of the realm of possibility from 30 feet in for Fredette, so Gonzaga’s defenders need to be on high alert. Free throw proficiency has been a major factor to Wisconsin‘s success this season, which is on the line in Saturday’s game against Kansas State. The Wildcats need to show patience in defending Wisconsin’s attack, and play smart defense. Butler guard Ronald Nored had to swallow his pride and accept a late-season move from a starting to role to a contributor off the bench. Will he provide a spark against the top-seeded Pittsburgh Panthers? For all the attention Jacob Pullen receives (and deservedly so), Rodney McGruder is one of Frank Martin‘s more underrated players. Six-foot-four guards who average six boards a game don’t fall out of the sky. One auto bid and a host of major conference games are on tap today, two days out from Selection Sunday. The afternoon session features plenty of bubble teams making their closing arguments to the Selection Committee. All rankings from RTC and all times Eastern. We’ve heard all kinds of things about this game from an elimination game to a play-in game. Whatever it may be, one team will be looking better than the other by the time it’s over. Alabama beat Georgia in the regular season finale six days ago and now they meet again in another game with major NCAA implications. RTC’s resident bracketologist had Georgia in and Alabama the first team on the “out” list as of last night while Joe Lunardi over at ESPN has the Bulldogs as the last team in the field and the Crimson Tide in the same position as RTC. This game will be played almost exclusively in the paint as neither team shoots it well from deep. Both teams rank in the top 20 in interior defense but Georgia has to avoid turnovers to win. Alabama thrives on giveaways despite their slower tempo, ranked #28 in defensive turnover percentage. Georgia committed 16 turnovers in the loss to the Tide last week and lost the game despite out-shooting Alabama from the floor. Senario Hillman leads Alabama in steals and will look to harass the Georgia guards all game long. The battle in the paint between Trey Thompkins and JaMychal Green could determine the outcome of the game if the Bulldogs don’t turn it over often. Illinois is generally considered to be in the field of 68 but Michigan could really use a win. The Wolverines are likely in as of now but a loss here and other results around the country could make it a very close call on Sunday. The Illini won the only meeting of the regular season, a two point win in Champaign on February 16. Michigan protects the ball very well but rebounding and defense did them in against Illinois in that game. John Beilein would love to play this game in the half court where his team can probe and dissect the Illinois defense, although the Illini rank tenth in three point defense and Michigan fires up almost 23 triples per game. With two dynamic playmakers in Darius Morris and Tim Hardaway Jr, Michigan can break a team down off the dribble of spot up for a three. This is a game they definitely can win but a better effort on the glass is needed. Michigan ranks near the bottom of D1 in offensive rebounding percentage (that will happen when you shoot so many threes) and was out-rebounded in the loss to Illinois last month. Rob Dauster of Ballin’ Is A Habit is the RTC correspondent for the Big East conference. With action at Madison Square Garden set to tip Tuesday, get up to speed with RTC’s regular season recap and postseason preview. Tourney Favorite: Notre Dame: The Irish have been rolling through conference play, winning 11 of their last 12 games. Ben Hansbrough and Tim Abromaitis are playing as well as they have all season long. The Irish are the second best team in the conference, and they have owned the best team (Pitt) the past two seasons. And If They Lose? : Pitt Panthers: The Panthers’ biggest strength — their offensive rebounding ability — has taken a hit with Talib Zanna going to the bench with a broken thumb. But they still have Gary McGhee and Dante Taylor, and experienced leaders in their backcourt (Ashton Gibbs, Brad Wanamaker, Travon Woodall). Sleeper: West Virginia Mountaineers: Is this team really a sleeper? They are ranked in the top 25, they won this tournament last season, and they made the Final Four. That said, the ‘Eers seem to finally be hitting their stride, as Kevin Jones and Joe Mazzulla are playing their best ball of the season. Don’t Bet Against: St. John‘s Red Storm: The Johnnies have been great at home this season. Guess where the Big East Tournament is being held? You Should Bet Against: The UConn/Georgetown Winner: The Hoyas are still playing without Chris Wright. Since he went out, the Hoyas scored four field goals in the second half in a loss to Cincinnati, scored 51 points in a loss to Syracuse, and scored just 47 points in another loss to the Bearcats. UConn has struggled down the stretch as teams have begun to figure out how to stop Kemba. When they run into capable defensive teams (i.e. Pitt), they struggle. Players of the Week: Ben Hansbrough and Tim Abromaitis, Notre Dame: Ben Hansbrough was sensational this week. In three games, he averaged 27.7 points, 5.3 assists, and 3.3 rebounds per game. He shot 25-40 (62.5%) from the field, 12-20 from three (60%), and 21-25 (84%) from the line. Efficient much? Abromaitis was just as good. Prior to this week, Abro had scored 13 points just once since January 8. He scored at least 22 points in each games this week, averaging 26.7 PPG and 5.7 RPG. He shot 27-49 (55.1%) from the floor and 17-29 (58.6%) from three. When those two are clicking like that, the Irish are going to be very tough to beat. Team of the Week: Louisville: The Cardinals just keep rolling along. After sweeping Rutgers and Pittsburgh this week, Louisville has now won three games in a row to move into a tie with St. John’s for third place in the conference standings. Finishing in the top four would give the Cardinals one of the double-byes in the Big East Tournament. The bad news? The Cardinals lost Rakeem Buckles for the season with a torn ACL in the win over Pitt. I’ve been saying it all season long — Pitt is susceptible to being upset when they are pressured. Ashton Gibbs, Brad Wanamaker, and Travon Woodall are all terrific basketball players, but none of them are what you would consider a great ball handler. It cost them against Louisville. But they were also hurt against the Cardinals with their inability to get to the offensive glass. The biggest reason Pitt is such an offensively efficient team is their ability to score on second and third shots. See the above “Player of the Week” feature to read about the surprise near the top of the standings. The Johnnies just keep on winning. After knocking off Villanova on Saturday, their streak has been extended to seven consecutive wins in the Big East (seven of eight overall, as there was a trip to UCLA thrown in that mix). The catalyst has been Dwight Hardy, also known as the “Baddest Man on the Planet”, who is averaging 28.3 points per game over the last eight games to throw his name into the mix for Big East player of the year. Here’s my concern with Syracuse: they blew a big lead to Georgetown, who was without Chris Wright, and had to rely on Scoop Jardine to save the day. Scoop’s a good player, but he’s not exactly what I would term “consistent.” They got nothing from Kris Joseph or Brandon Triche in the game. Rick Jackson is a glorified glue guy (and I mean that as an enormous compliment). Road wins at Villanova and Georgetown will move you up in the Power Rankings, but I’m not buying this team in the long term. I wrote an extensive post on the Huskies and their reliance on Kemba Walker‘s offensive output yesterday. 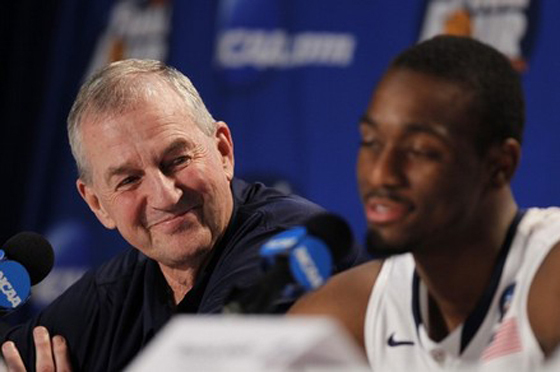 Essentially, the key for UConn on the offensive end is to get movement going around Kemba. Defenses are going to collapse on him, but help defense is much tougher when the offensive players are moving without the ball. UConn struggles when they are reduced to standing around and watching Kemba try to score. The Hoyas clearly still have fight in them, but without Chris Wright, this team is thoroughly mediocre. They simply don’t have enough offensive firepower. Wright is the Hoyas’ best playmaker and best creator. When he isn’t on the floor, Georgetown’s offense is no where near as dynamic or dangerous. Villanova is in a free fall. Honestly, I have no idea what to make of this team. They’ve lost five of seven and seven of 11. They certainly have talent on their roster, especially in the backcourt, but for the second straight season, the wheels have come off. West Virginia probably isn’t in any danger of missing the NCAA Tournament, but if they lose to both UConn and Louisville this week, then bow out in the first round of the Big East Tournament, the committee is going to have to take a look. Marquette’s win over the Huskies on Thursday all but sent Buzz Williams’ team to the NCAA Tournament. If they can close out against Cincy and Seton Hall, they will lock up their bid. Cincinnati can probably feel a bit safer than Marquette at this point. They have fewer losses and a better RPI. 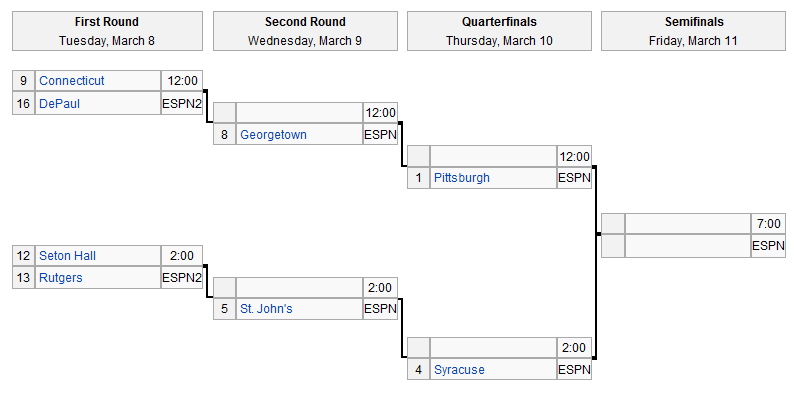 But with Marquette and Georgetown on the schedule for this week, they need to play like they’re still trying to get in. There are some really important games down the stretch that will determine the seeding for the Big East tournament as well as seeding (and bids) for the NCAA Tournament. With five teams currently sitting with seven or eight losses in the 7-11 spots in the standings, the race will be on to see who gets those last two first-round byes. With only two weeks left in the regular season, every game now becomes critical. Syracuse and Villanova battle it out tonight in Philly, trying to position themselves for a double-bye in the Big East Tournament. In Lawrence, a shorthanded Kansas team will look to keep rolling against Oklahoma State. All rankings from RTC and all times Eastern.